(CNN) -- Forget al Qaeda, Weapons of Mass Destruction and the Axis of Evil. A once obscure acronym is on the lips of President Barack Obama, just about every politician in Washington and a lot of angry taxpayers nationwide. 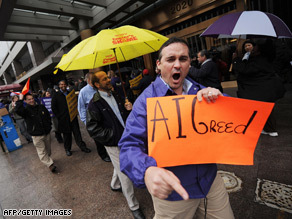 AIG's plans to pay hundreds of millions of dollars in executive bonuses have enraged many Americans. It's AIG, American International Group, a trillion-dollar company operating in 130 countries that was one of the most trusted names on Wall Street. Obama calls its business practices "an outrage" and Republican Senator Charles Grassley called on AIG executives to "resign or go commit suicide." AIG sells insurance on people's lives, homes and mortgages, but it also made a lot of money on complex deals between financial institutions. When the mortgage market collapsed, AIG didn't have enough money to pay-out on its policies, threatening havoc in U.S. housing and global high-finance. Late last year, Washington intervened, taking control of the company and injecting $170 billion to meet its obligations. Then this week, the country was stunned by the news that AIG planned to award about $165 million in bonuses to its executives -- including those who were apparently responsible for the complicated financial arrangements that brought the company down. There was no reason for anyone in Washington to be surprised: AIG has been under government control for months and it announced the bonus payouts well in advance. But President Obama spoke as if they were a sudden shock. He announced his administration would "pursue every legal avenue" to block the payments. In fact, the bonuses are written into contracts the administration is reluctant to break. Republicans and Democrats are rushing to suggest ways to get at the money nonetheless. Attacking AIG is smart populist politics, an easy way to exploit the outrage of ordinary voters. The president also has a much bigger political goal. Obama isn't through bailing out the U.S. economy or spending billions to do it. If Americans come to believe that they are being tricked into subsidizing scoundrels, they're not likely to support the president's plans. And AIG's extravagance could cost us all a lot of money if it turns the company a bigger problem than it already is.